Voodoo has gotten a bad rap over the years. People always think of black magic and danger when they think of voodoo, but it’s not all bad. Sometimes bad can be cute, too! Your child agrees with us! Why would anyone practice magic if they couldn't be a little bit bad with it? This costume introduces your little girl into the world of black magic and voodoo, but without the hassle of having to travel to a remote island and becoming an apprentice to a Voodoo practitioner. (Sometimes, that can take years!) With this dress costume, she'll have the look but she might not be able to actually practice the craft. And maybe that's a good thing. Well, actually, we know that it’s a good thing! You don’t want to wake up with your head sewn to the carpet, after all! This girl’s voodoo costume is perfect for Halloween or any other theme event she may need to attend. The tan dress has a zipper closure in the back for easy on and off and the petticoat is attached at the waist to give it some additional volume that will hold all night long. The dress has detailed printed heart details and felt faux stitching on the sides and shoulders for added details you won’t find anywhere else. 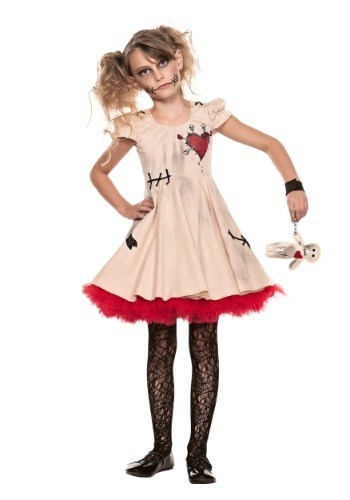 Also included with this costume is a black wristband that fit with Velcro and has stuffed voodoo dolls attached. After all, a voodoo wouldn’t be voodoo without a minature doll to take all of the curses your child can throw at it (metaphorically, of course).